We’ll start with the good news this morning. The seasonally adjusted unemployment rate in Oregon stands at 9.1 percent in November; the corresponding rate for the nation is 8.6 percent. Both the national and Oregon rates declined 0.4 percent in November, reaching their lowest levels in 3 years, or just as the bottom of the economy fell out in late 2008. While a declining an unemployment rate is good news it can be caused by a number of outcomes: more employment (good), less unemployment (good), less individuals looking for work (typically bad). Over the past year the number of individuals looking for work increased 7,300 while the number of employed individuals increased 36,700 leading to a decline in the unemployment rate of 1.5 percentage points from Nov 2010 to Nov 2011. While we typically focus on employment by recessions in our graphs, the following two graphs highlight the Oregon unemployment rate, seasonally adjusted, by recession since 1950. Each graph is organized by recession and the horizontal axis is based on the “Peak” month, which refers to the single month where the unemployment rate was at its highest level during each particular cycle. Thus, the horizontal axis covers a four year time period (the one year preceding the peak unemployment month through the three years that followed the peak month.) The first graph simply illustrates the unemployment rate by recession. 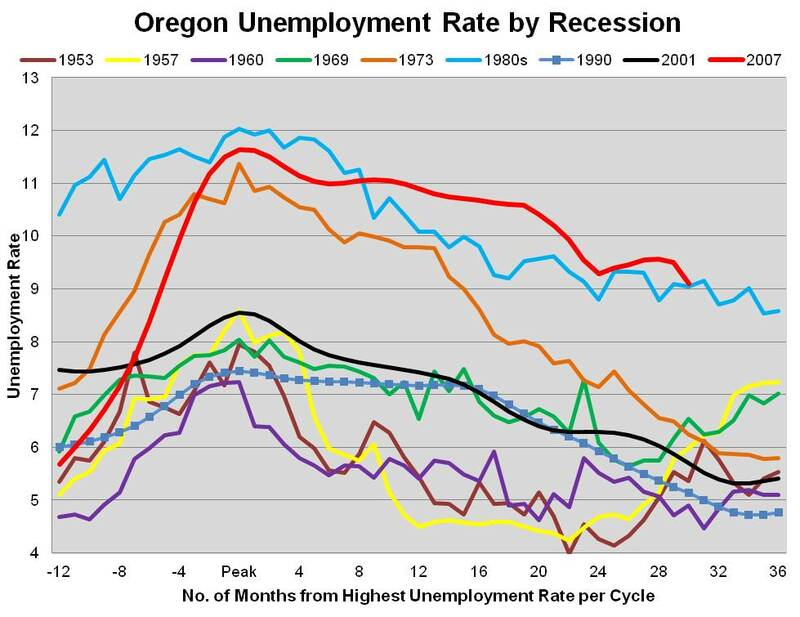 Currently, after 30 months from the peak, Oregon’s unemployment rate of 9.1 percent is nearly identical to the unemployment rate in the state 30 months following the cyclical high in the early 1980s recession in Oregon. The second graph takes the same exact numbers but indexes the cyclical high to 100. By normalizing the data in this way, it allows one to better compare how the unemployment rate changes over time from one cycle to the next. The current recovery has been slow, even by historical standards, given that the improvement in the unemployment rate after 30 months is the smallest, in percentage terms, on record over the past 60 years. Now, the unemployment rate is moving in the right direction (down) and for good reasons (more individuals reporting being employed), however the pace of improvement is slower than one would hope for. It should be noted that the reason the lines corresponding to the 1953, 1957 and 1969 recessions are rising by the time we reach the 30-36 months past peak period is due to the fact that they are running into the next business cycle, thus the unemployment rate is beginning to rise again. 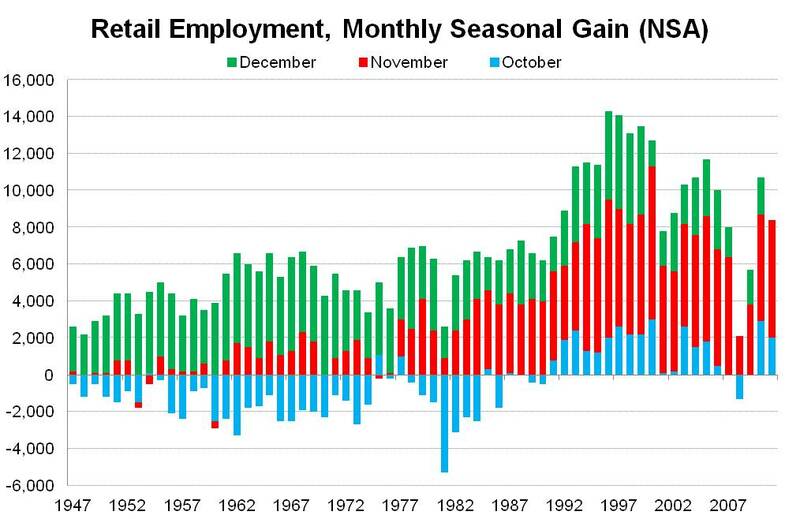 The bad news comes from the Establishment Survey which shows that in November, Total Nonfarm Employment decreased 1,600 on a seasonally adjusted basis. The private sector lost 700, while the public sector fell 900. Revisions to October were also to the downside as the state now lost 600 jobs instead of the preliminary estimate of an 800 job gain (net swing of 1,400 for the month due to revisions). Obviously the past two months’ worth of payroll data are not positive, however taking a step back, they do not change the perspective that after an initial surge in late 2010 and early 2011, employment in the state has been essentially flat with no real movement either up or down the past 10 months. Unfortunately given the state’s lack of growth in recent months, Oregon’s employment growth since January 2010 is now the same as the nation’s (actually slightly less.) 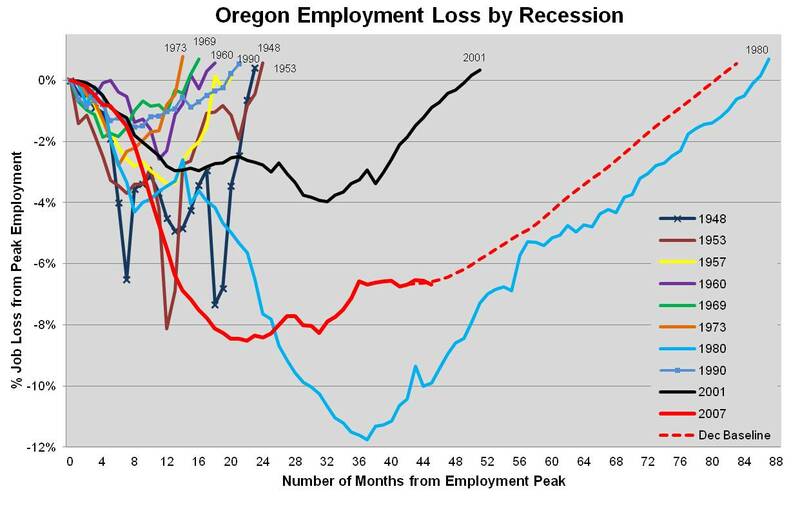 Oregon typically experiences more volatile movements over the business cycle than the nation and given that we are now in recovery, disappointing at that, Oregon should be expected to grow quicker than the US overall, however according to the preliminary data this is not happening. Every year the BLS (for the US) and the Employment Department (for Oregon) revise their monthly employment data based on a more complete information set. This is known as the annual benchmark revisions and typically occur early in the year for the prior year’s data. 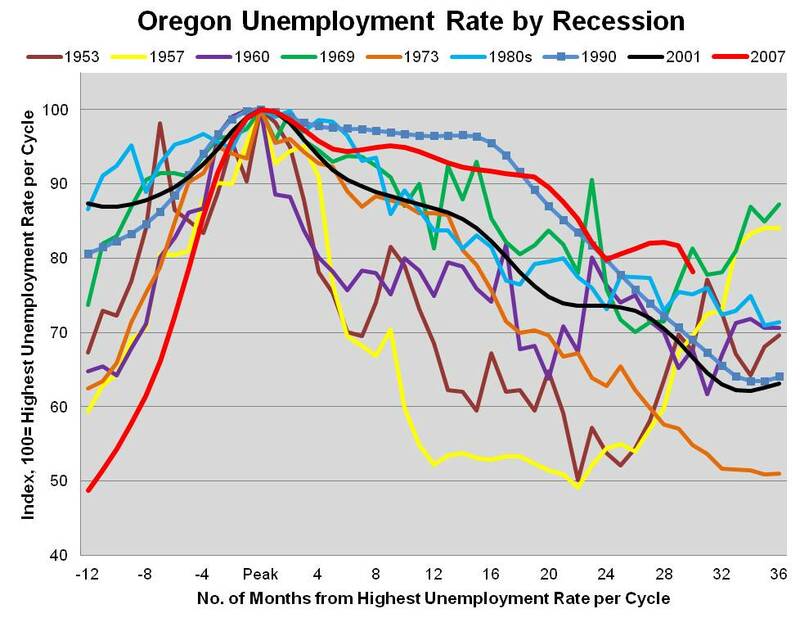 For Oregon, the next revisions will be released in March 2012, however our office has been calculating an unofficial estimate of the revisions to try and gauge the true underlying trend in Oregon employment. Unfortunately the data used for the benchmark process is not as timely as the monthly survey, hence why the monthly survey data is used in real time. However the QCEW data does have better coverage as it is based on the unemployment insurance records for all employees in Oregon. 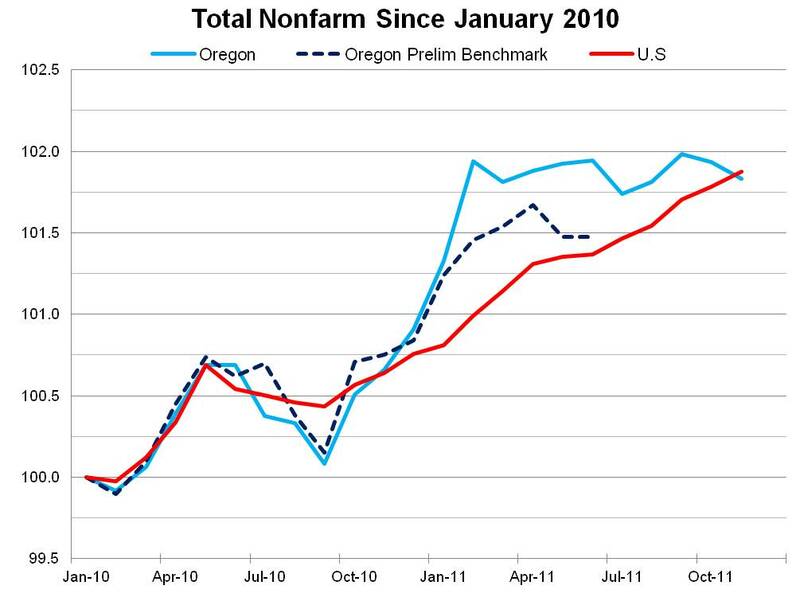 Today, QCEW data has been released through June 2011 and the following graph illustrates Oregon and the US’s growth since January 2010, along with our office’s estimate of the benchmark revisions through June. As one can see, the unofficial estimate calculated by our office for the revisions will be slightly down in early 2011. It is our belief that the official employment data from early 2011 (particularly February) probably overstated the true strength in the employment growth. It is also our belief that the true underlying employment trend in Oregon has not been flat over the past 10 months and most likely follows a path similar to the US data. While the QCEW data is not yet available for the July-September quarter, given the good news in recent months such as unemployment insurance claims continuing to decline in Oregon, industrial production continuing to increase and the continued upward revisions to national employment data, our expectations are for the revisions to Oregon employment data to show continued employment growth during the summer months. That is, our office’s expectations are for the dashed blue line to continue up much like the red US line during the July-current period. However, this cannot be confirmed nor denied until further QCEW data is released. Finally, a quick update on the seasonal retail hirings. Including revisions, 2011 retail hirings on a non-seasonally adjusted basis total 8,400 in October and November combined, or about the same level as in 2010 and 2005.